An Ashly Audio ne24.24M modular Protea matrix processor outfitted with 12 inputs and 12 outputs provides all of the equalization, delay, ducking, and routing for Diggerland USA, and seven Ashly KLR-3200 amplifiers power the park’s 70-plus Community loudspeakers. 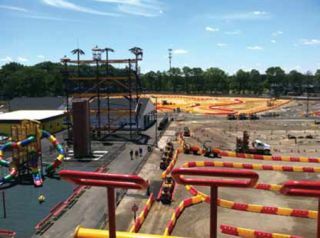 HAMMONTON, NJ—Diggerland USA is a construction-themed adventure park that allows children and their families to operate real construction equipment in a safe environment. The 14-acre park is located adjacent to its sister attraction, Sahara Sam’s Oasis, in New Jersey in the suburbs southeast of Philadelphia, PA.
Perhaps not surprisingly for a park based on construction themes, the project went quickly, progressing over just six months from land clearing to opening. Spellcaster Productions of nearby Hammonton, NJ designed and installed the audio system at Sahara Sam’s Oasis, and for Diggerland USA the parks’ owner was looking for a similar setup that would play background music and advertisements, either of which would duck for pages made from a Shure wireless microphone or from the park’s phone system. An Ashly Audio ne24.24M modular Protea matrix processor outfitted with 12 inputs and 12 outputs provides all of the equalization, delay, ducking, and routing for Diggerland USA, and seven Ashly KL R-3200 amplifiers power the park’s 70-plus Community loudspeakers. Ashly’s networked neWR-5 wall-mount user control allows staff members to adjust input and volume within a given zone, and Ashly’s iPad app gives management complete control of the park’s audio from anywhere via Wi-Fi. All of the input sources feed the Ashly ne24.24M processor, which in turn feeds a rack of seven Ashly KL R-3200 two-channel amplifiers. The KL R-3200 is rated at 1600W into a 2-Ohm load, 1100W at 4 Ohms or 800 Watts per channel into a 70V line. This versatility makes it a perfect choice to power the Community Sound-centric loudspeaker system. Community D4LP loudspeakers cover indoor areas with low ceiling height, Community DP8 pendant loudspeakers cover a food pavilion and an arcade, and Community R.15 and R.35 loudspeakers throw from light poles to cover the vast outdoor spaces. The Ashly Remote App for the Apple iPad or iPad Mini is used to provide the theme park management team with a customized wireless remote control. “I arranged it so that the app’s home page lists each zone with a radio button to select the input source,” said Shafer. “That, together with a volume slider for each zone, allows them to do everything they need to do. Because we gave them Wi-Fi throughout the park, they can make adjustments right there in the park—no walking back and forth to an equipment closet.” For staff within the arcade, the picnic area, and the concession stand, Shafer installed Ashly neWR-5 wall-mount remotes, which allow input selection and volume selection.